I selected these seedpod specimens from the collection of scientist and curator Dr. Klaus Dobat at the Botanischer Garten Tübingen, Germany. I photographed and transferred them on site, using a Wista 4x5 view camera in a temporary “studio” created in the gardener’s lounge. The seedpod forms exemplify nature’s creation of its own art, its form following function—survival of the species. 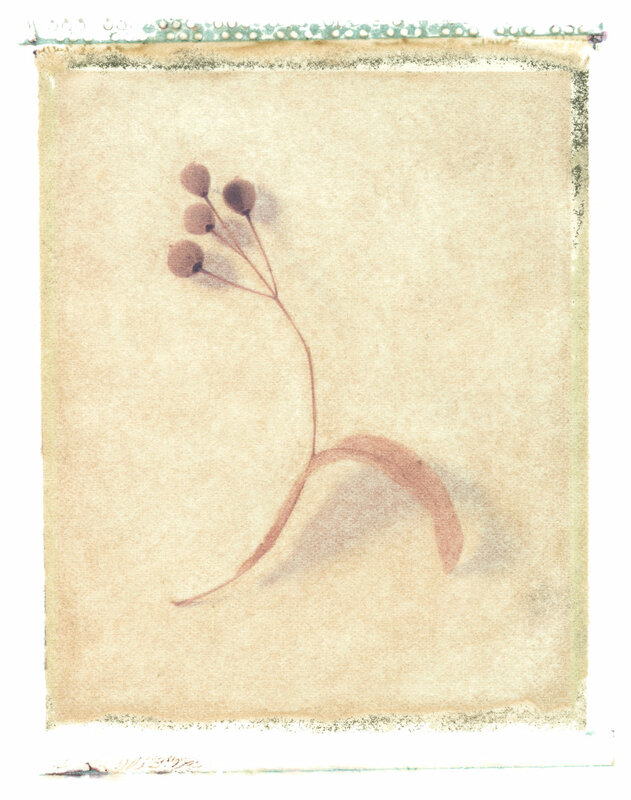 I began making Polaroid transfers twenty-five years ago, using large format 4x5 and 8x10 view cameras. To make these images, I place the specimen before the camera and the film is exposed. After processing, I promptly pull it apart. Then, I quickly place the negative face down onto a sheet of water-soaked watercolor paper so it quickly absorbs and retains the dyes. I allow the negative to sit on the paper for several minutes before slowly and carefully peeling it away.